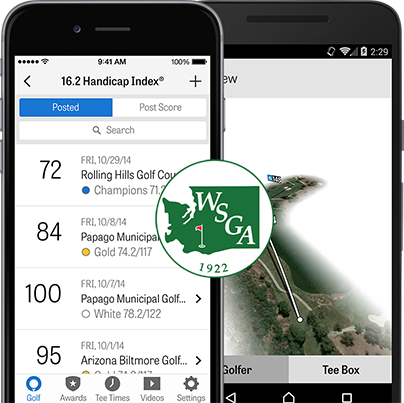 The WSGA has partnered with Golfshot to bring you effortless Handicap Index® tracking and score posting to your GHIN® Account through our award-winning golf GPS app! WSGA members get their first year of Golfshot Pro for only $19.99! The Golfshot app provides a great service, helping golfers better their game like a caddy, right on the course with them every step of the way. Golfshot Pro allows golfers to track their Handicap Index® in an incredibly seamless way, and we are excited to extend this to our WSGA members. Golfers all across the state of Washington and Northern Idaho should definitely give Golfshot Pro a try, they won’t regret it! Like a personal caddie on the course, Golfshot Pro gives you accurate GPS yardages to targets and hazards, rich scoring and shot tracking, detailed statistics and entire course flyover previews. WSGA members get Golfshot Pro’s game-improving features for just $19.99.